Haiti Launches Largest-Ever Emergency Cholera Vaccination Campaign : Goats and Soda Haiti rolls out an effort to vaccinate 800,000 people in parts of the country devastated by Hurricane Matthew. 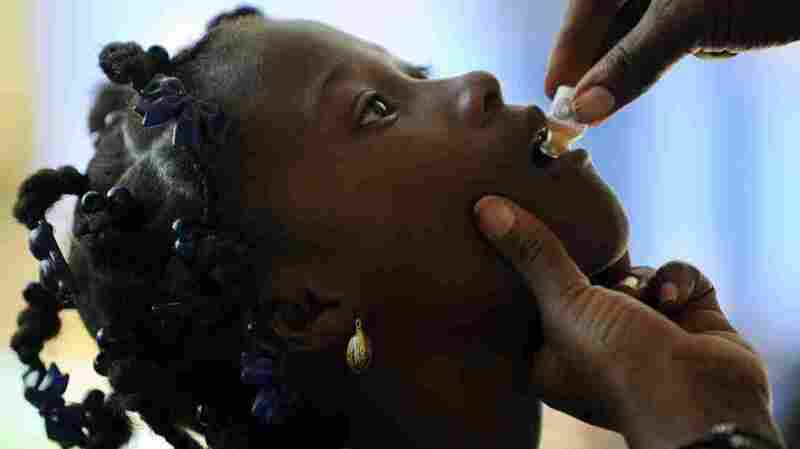 Haiti on Tuesday launched the largest emergency cholera vaccination campaign ever attempted. The plan is to try to vaccinate 800,000 people in parts of the country devastated by Hurricane Matthew. Immediately after the Category 4 storm tore across southwest Haiti last month, the number of reported cholera cases across the country shot up dramatically. In some storm-ravaged areas it jumped tenfold. Nationwide, the number of new cases went from roughly 75 a day to well over 200. To try to slow this surge in cholera, the Haitian Ministry of Health and international aid groups plan to vaccinate almost everyone over the age of 1 in southwest Haiti. Cholera is a potentially fatal water-borne disease that can cause severe diarrhea and dehydration. This will be a huge logistical challenge. The vaccine needs to be kept between 36 and 46 degrees Fahrenheit up until the day it is administered. Some towns and villages in this part of the country were totally destroyed by the hurricane. Roads were damaged and electrical power lines snapped. "There is still a population that is extremely difficult to reach," says Jean-Luc Poncelet, the World Health Organization's representative in Haiti, about some areas that remain inaccessible by road. "That will continue unfortunately for a little while. Road access will remain complicated because those roads were already bad before the hurricane." Normally the oral cholera vaccine is given as two doses spaced at least two weeks apart. The immunization campaign in Haiti, however, is going to use only a single dose due to a global shortage of vaccine — and the logistical challenge of launching a follow-up drive. Two doses of the relatively new oral cholera vaccine offer roughly 65 percent immunity, while a single dose protects about half the people who get it. Health officials, however, say blocking the disease in even half the population will cut the overall amount of cholera bacteria circulating in the environment. And thus make it less likely that people will be exposed to the bacteria. Poncelet, the WHO representative in Port-au-Prince, says immunization alone is not going to wipe out cholera in Haiti. "We are far from elimination, very unfortunately. When cholera enters into an area it's extremely difficult to get rid of it," he says. This outbreak began when U.N. peacekeepers inadvertently introduced the bacteria to the island in 2010. Since then, it has sickened roughly 800,000 people and killed at least 9,000 more, making it one of the largest outbreaks in modern history. "It's huge. We haven't ever seen anything quite like this," says David Sack at the Bloomberg School of Public Health at Johns Hopkins in Baltimore. Sack has studied cholera for years. Cholera spreads when human sewage contaminates drinking water supplies. Sack says the incredibly poor sanitation infrastructure in Haiti allowed the bacteria to take off across the country. Cholera is a disease about global inequality, says Sack. "It's a disease that we should not have in the 21st century." Sack predicts the mass vaccination campaign should tamp down this outbreak and keep it from exploding, but he says the long-term solution to cholera in Haiti is ensuring that everyone has access to clean drinking water. "It's only due to the lack of effort that we still allow [cholera] to persist," he says.